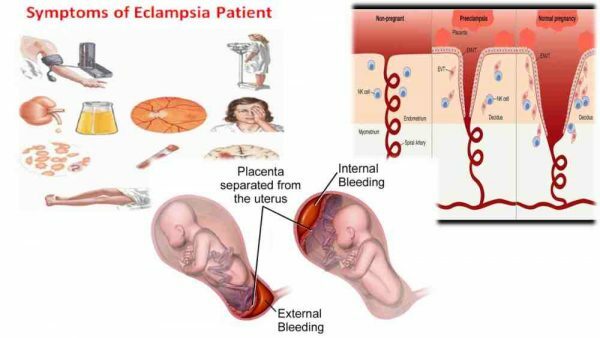 Home » Health » What Is Eclampsia? Eclampsia is a serious condition due to preeclampsia in pregnant women, which is characterized by seizures. In other words, preeclampsia accompanied by seizures is called eclampsia. Eclampsia is a rare condition, but must be addressed immediately if it arises because it can endanger the life of the mother and the baby she is carrying. Eclampsia can occur when pregnant women experience severe hypertension or preeclampsia, where seizures have emerged. Seizures can be followed by a decrease in consciousness or an empty gaze. Preeclampsia generally occurs in the last trimester of pregnancy, and the risk of developing seizures (eclampsia) is when approaching labor. Eclampsia seizures can be divided into 2 phases. The first phase is seizures around 15-20 seconds which are marked by twitching around the face. After that, eclampsia seizures will enter the second phase which is characterized by muscle spasms around the jaw, eye muscles, and eventually spread throughout the body for about 60 seconds. In order to avoid the dangers of eclampsia, the most effective way is to detect the risk of preeclampsia in the early days of pregnancy. Hypertension. Preeclampsia can occur due to high blood pressure which can damage blood vessels both arteries, veins and capillaries. Damage to arteries will cause the blood flow to be disrupted so that it interferes with the brain's performance and can inhibit the growth of the baby. Proteinuria. Proteinuria is the presence of protein in the urine caused by impaired kidney function. This condition can appear if the glomerulus, the kidney that functions to filter the blood, is damaged so that the protein can escape screening. The discovery of protein in urine is an important clinical sign in diagnosing preeclampsia in pregnant women, even though it does not show symptoms. Other symptoms of preeclampsia can also appear such as swelling of the arms and legs and sudden weight gain during 1-2 days of pregnancy. Even so, pregnant women who do not experience preeclampsia can also experience these symptoms and that is normal in pregnancy. The presence of fluid in the lungs (pulmonary edema). If severe preeclampsia in pregnant women is accompanied by convulsions, this condition is called eclampsia. Before seizures occur, there are usually symptoms of nervous disorders, such as headaches and decreased vision. Symptoms of preeclampsia generally disappear around 1-6 weeks after delivery. Until now, the cause of preeclampsia and eclampsia is not known with certainty. However, a number of allegations suggest that this condition is caused by vascular abnormalities and abnormalities in the placenta. Pregnant in adolescence or over the age of 40 years. Have a history of preeclampsia or eclampsia in a previous pregnancy. Have hypertension before undergoing pregnancy. Underwent a pregnancy carried out through an egg donor or artificial insemination. Having sickle cell anemia . Has a weak immune system. Complete blood cell count (complete blood cell count) . Complete blood cell analysis can show whether a person has preeclampsia or other disorders, such as thrombocytopenia, microangiopathic hemolytic anemia, or HELLP syndrome (disorders of the liver which is one form of severe preeclampsia). Complete blood cell counts can also be used to see the levels of bilirubin and serum haptoglobin in the blood. Hematocrit analysis. This method is done to count the number of red blood cells per volume of blood, which plays a role in transporting oxygen so that oxygen intake for pregnant women and their fetus is still maintained. Serum creatinine test. Creatinine is a waste from the muscle that is flowed through the blood and is discharged through the kidneys. However, if the kidneys are damaged by preeclampsia and eclampsia, creatinine levels will increase in the blood due to creatinine screening does not go well. Urine test. The presence of protein in urine (proteinuria) is an important sign of the occurrence of preeclampsia and eclampsia in pregnant women. Protein levels in urine commonly found in the urine of pregnant women with preeclampsia are above 1 g / L. In addition, uric acid levels can also increase. Ultrasonography (USG) . An ultrasound examination performed on pregnant women who experience preeclampsia and eclampsia serves to ensure the condition of the fetus is in good condition. Through ultrasound examination, the condition of the fetus can be assessed by checking the heart rate and fetal growth. Other scanning methods that can be done other than ultrasound are MRI and CT scans, especially to ensure there are no disorders other than preeclampsia and eclampsia. Treatment of eclampsia must pay attention to the condition of pregnant women at that time. When preeclampsia that appears has entered the stage of eclampsia, the main treatment is labor, if the pregnancy is already enough months. In addition, eclampsia can also occur within 24 hours after delivery. Some drugs that function to lower blood pressure to below 160 mmHg, including hydralazine, labetalol, and nifedipine . Magnesium sulfate . Magnesium sulfate serves to reduce the risk of return of seizures in pregnant women who experience eclampsia, and is usually given as a solution intravenously. The administration of magnesium sulfate to relieve seizures is carried out for 24-48 hours. Diazepam, phenytoin, and sodium amobarbital. These three types of drugs can be given if seizures occur again in pregnant women even though magnesium sulfate has been given. After seizures in pregnant women can be relieved, the doctor can prepare a baby's delivery so that preeclampsia and eclampsia can be stopped, especially if the fetus is old enough to be delivered. Labor can be done by caesarean section or normal vaginal delivery. Vaginal delivery, can be done especially in pregnant women who are nearing the estimated date of labor. To help vaginal labor, oxytocin can be given which serves to induce labor by stimulating uterine muscle contractions. If eclampsia occurs in pregnant women with a gestational age of less than 34 weeks, caesarean delivery is recommended. Caesarean delivery should also be done immediately if there are signs of fetal distress in eclampsia. To help the development of fetal lungs, steroids such as corticosteroids can be given. Central nervous system damage and intracranial bleeding due to recurrent seizures. Other symptoms of central nervous system damage are cortical blindness, due to damage to the brain's occipital cortex. Acute kidney failure and other kidney disorders. Circulatory system disorders, such as disseminated intravenous coagulation (DIC). Coronary heart disease and stroke . The reappearance of preeclampsia and eclampsia in subsequent pregnancies. Most pregnant women who experience preeclampsia and eclampsia can undergo pregnancy and childbirth without any problems. Even so, there can be interference with postpartum blood pressure. In some women who have a history of preeclampsia and eclampsia, the risk of hypertension can continue in the next pregnancy. Babies born to pregnant women who experience preeclampsia or eclampsia generally can live normally like other babies, although often born prematurely and have to stay in the hospital longer. The number of deaths in pregnant women due to eclampsia is only about 1.8% of the number of cases of eclampsia recorded. Often the death of pregnant women due to eclampsia is associated with other conditions, such as HELLP syndrome and platelet deficiency. While fetal death due to eclampsia is often caused by interference or damage to the placenta, fetal growth disorders in the uterus, and hypoxia (lack of oxygen) in the fetus. Take low-dose aspirin . Aspirin can play a role in preventing blood clots and wasting of blood vessels so that it can prevent the appearance of preeclampsia. In addition, taking low-dose aspirin can reduce the risk of fetal death due to eclampsia, reduce the risk of premature birth, and prevent placental abruption (release of the placenta from the uterine wall before labor). Maintain blood pressure. In women who have hypertension problems before undergoing pregnancy, maintaining blood pressure will greatly help reduce the risk of eclampsia. In this way, the doctor can detect signs of preeclampsia and treat them immediately. Maintaining blood pressure can be started during pregnancy planning until delivery. Take supplements containing arginine and vitamins. Several studies have shown that administration of arginine and vitamins (especially antioxidant vitamins) can help reduce the risk of preeclampsia and eclampsia, especially if it starts in the 24th week of pregnancy. 0 Response to "What Is Eclampsia?"